The laboratory was created under the leadership of Hubert de Verneuil in 2002 (INSERM E017), renewed in 2007 (U876) under the name “Therapeutic Gene transfer in Stem Cells” then recreated in 2011 (U1035 ) under the heading “Biotherapies for genetic diseases and cancers”. The initial gene therapy focus targeting erythropoietic porphyria (hematological axis) led to the development of a vectorology platform. The dermatological axis developed around epidermal reconstruction, pigment cell biology, and the transfer of genes coding for antioxidant enzymes in skin stem cells to improve skin photoprotection against UV irradiation, a process applied in priority to xeroderma pigmentosum (theme related to the National Reference Center for Rare Diseases Skin created in 2005 under the direction of Alain Taïeb). Over the years, the unit has strengthened its axis around hematology by studying chronic myeloid leukemia (CML, FX. Mahon team) and its dermatological axis which has led to the emergence of an ATIP-Avenir labelled team in 2014 (J. Seneschal). The observation made by clinicians that propranolol inhibited very efficiently the growth of infantile hemangiomas led to launch a new project on the role of the β-adrenergic system in angiogenesis (C. Léauté-Labrèze). Further work on induced pluripotent stem cells (iPSC) under the direction of F. Moreau-Gaudry broadened the gene therapy axis using these cells in erythropoietic porphyria and as a cancer modeling tool (CML, pancreatic cancer). 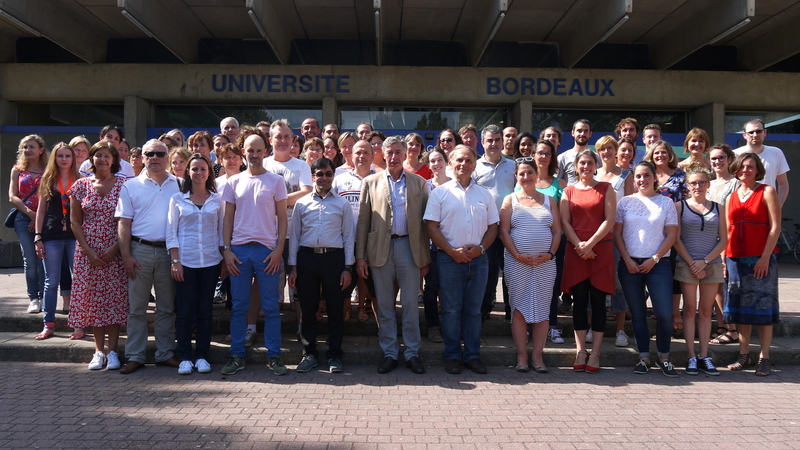 The unit “Biotherapy for genetic diseases, inflammation and cancer” was recreated in January 2016 under the direction of Alain Taïeb. It has been heavily restructured but still has a biotherapy iPSC / vectorology base that irrigates translational fields in dermatology, hematology and oncology. Rare diseases remain at the heart of fundamental research, with the therapeutic paradigm “translation from rare to common” applied to several projects. The hematology project has been refocused under the direction of JM. Pasquet on a subset of acute myeloid leukemias (AML), diseases that warrant more fundamental research after the notable progresses in the treatment of CML since the introduction of Glivec. The originality of the AML project is to combine clinical expertise (N. Milpied), regenerative medicine (Z. Ivanovic, EFS-bloodbank) and oncogenic signaling (JM. Pasquet) around the condition. For the three dermatology diseases targeted by the research projects namely xeroderma pigmentosum (XP), vitiligo and infantile hemangioma (all in connection with the reference center), with cognitive impact covering the initiation of UV-induced cancers and aging (targeting NOX1), immunological treatment of melanoma, and antiangiogenic cancer treatments. A new team has joined the unit, the miRCaDe team federated by C Grosset around pediatric cancers, especially hepatoblastoma, and modulation of oncogenic signaling pathways by noncoding RNAs.